UFO Spotted: Did Aliens also watch the Olympics opening ceremony? 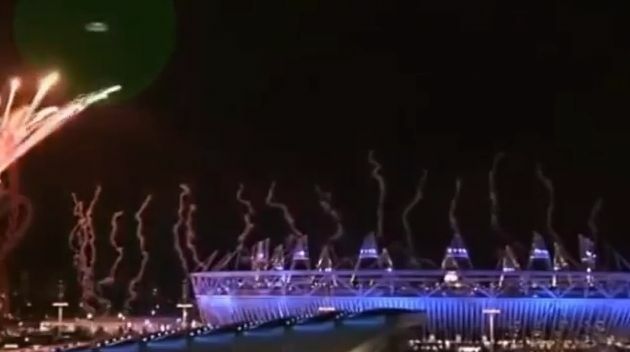 A video uploaded on YouTube shows a UFO like object captured in a video entering the screen from screen top left and moving right - does this mean aliens were also watching the London Olympics opening ceremony? Screen shot of the video shows the UFO on upper left of the screen: Were Aliens also watching? Only time and more deliberations will determine the true identity of the object - but from a a naked eye, it seems like a UFO. As reported by the Daily Mail, The incident came right at the close of last Friday's spectacular at the Olympic Park stadium in Stratford, east London at around 12.30am. The report also adds that UFO expert Nick Pope predicted aliens would appear at the Games.